With Slint’s hugely influential LP ‘Spiderland’ receiving a super-deluxe reissue on April 14th, through Touch & Go, Clash decided to question a musician whose work has distinctly been shaped by the sounds of the Louisville, Kentucky group’s enduring masterpiece: Mogwai’s Stuart Braithwaite. The word “seminal” undoubtedly gets applied to too many records undeserving of quite such a level of praise, but ‘Spiderland’ is one that fully warrants the use. Taking rock music into deep gorges of spacious introspection, harnessing stillness as a counter weapon to outright aggression, it’s a post-rock landmark that preceded the popularisation of its form by some years. Or, in other words: it was the bedrock upon which so many other bands set out their sonic stalls. 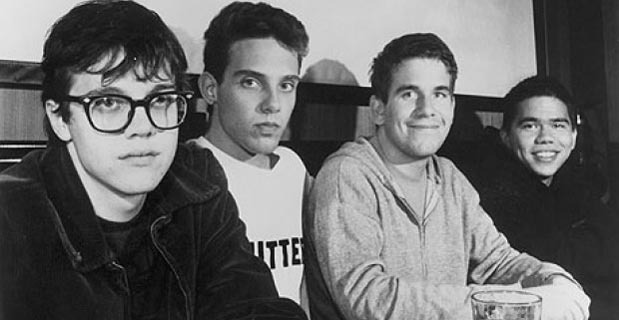 While the 1991-released ‘Spiderland’ wasn’t Slint’s first album – that was the rather less focused ‘Tweez’, issued in 1989 but recorded by Steve Albini two years previous to its eventual release – it was both their last and most celebrated collection. It’s a record that takes its time to impress – vocals are hazy, muted against lapping guitars, while percussion skits and skids atop basslines queasy with a constant motion sickness. But when it climaxes, bloody hell: the closing moments of final track ‘Good Morning, Captain’ can blast the skin off a face from 500 yards. The 2014 reissue of ‘Spiderland’ takes the form of a limited-edition box set spread over six sides of vinyl and three discs, featuring 14 previously unheard demos and outtakes, as well as new art. The original tracks have been remastered – but if you think that makes the vocals any clearer as the drama builds, think again, as those whispers remain as sinister as ever. A book with a foreword penned by fellow Louisville musician Will Oldham is included, as is Lance Bangs’ 90-minute documentary on Slint and the making of ‘Spiderland’, Breadcrumb Trail. ‘Like Herod’, from the band’s debut LP ‘Young Team’ (1997), was initially called ‘Slint’ in honour of… yup. “I didn’t hear ‘Spiderland’ when it first came out in 1991. I was aware of Slint through John Peel, but I didn’t have the album until we started the band. It was Dominic (Aitchison, bass) who let me hear them, and then I met other people who were obsessed by the band. Aidan Moffat has got a white label of theirs, which must be one of the biggest geek items of all time. “It was way before ‘Young Team’ that ‘Spiderland’ first impacted on me. When we started the band, Dominic and me would make each other mixtapes. He always had a lot of American music on his – bands like Rodan, and Will Oldham, and Slint. Whereas mine would be more old, psychedelic music, or bands like Joy Division. I think we were taking from everything back then, as to be honest we couldn’t really play much. So being able to sound exactly like Slint wasn’t really on the agenda! “But yeah, when I heard it, it was unlike anything I’d heard before. I still don’t know if I have heard anything else like it, now. Obviously a lot of bands take a lot from it – I know that we did, but there’s also PJ Harvey, and Fugazi. A lot of bands took a lot from it. But I don’t think that any band influenced by Slint has managed to capture the same atmosphere as ‘Spiderland’. It’s really unique in that respect, and having seen the documentary that comes with this reissue, you get a real sense of the kind of belief that the band had, you understand how self-motived they were. They were self-contained. “Today, I’m really good friends with (Slint guitarist) David Pajo, but all of the members are really interesting. I’ve met them through Tortoise. The Slint guys aren’t ‘usual’ people, and that comes through on the documentary. And I think that’s really great – it’s a really great film. People will enjoy it, even if they’re not that interested in Slint’s music. It’s a story about some unusual people who did something really, really special while nobody was looking. “The album’s full of moments, for me. It is a bit of a journey, isn’t it? But I suppose it all builds to ‘Good Morning, Captain’, which is just devastating. It’s an end that you’re not really expecting after what’s come before. The whole of ‘Washer’ is incredible, too. Basically, it’s a brilliant record. “They were very young at the time of making it – David’s told me about the band going on tour with Glenn Danzig when they were 14, which seems really mad. Looking at the documentary, and listening back, the way these kids could play their instruments is frightening. They’re probably the best musicians I know, all together. They cultivated this sort of psychic playing, by doing things over and over again, and you can really hear that on ‘Spiderland’. It’s really effortless, but it comes from practice. And it’s really emotional, too. “With a lot of this kind of technical music, you can be left feeling quite cold. The musicians are too preoccupied with scales, or the speed of what they’re playing. But Slint achieved a level of playing that was way above almost every other band – but they also had a goal, almost unspoken, but from the outside I think you can see that they were aiming for this very specific result, but it’s one that’s almost impossible to define… If that makes any sense. ‘Spiderland’ is a really special record, I guess is what I’m saying – and Breadcrumb Trail is a really special film. The film offers people, for the first time, the opportunity to really learn more about this record that’s been out a while. “The other thing is that I’m really pleased that Slint are getting the wider recognition that they’ve always deserved. They always had it in kind of cult circles – the record’s been loved for a long time by a lot of people. But I hope that with the reissue, it’ll spread its wings further. “I don’t know if we’ve actually opened people up to Slint ourselves, by being influenced by them. We talked about them a lot early on. In the late 1990s, they seemed like our generation’s Velvet Underground or something, this mythical band that everybody loved. But I’d like to think that we turned some people onto them. That’s a role of musicians, really, to introduce people who like your music to music that you like yourself. And I know that when I was growing up, people like Jason Pierce and Bobby Gillespie would talk about the records they were into, like The 13th Floor Elevators and The Cramps, and I’d check those bands out. So it’s a good way to go. I’m always suspicious of bands claiming to have no influences. I’ve no truck with those guys. “Through Slint, I did get into some other bands, bands that they were associated with. I actually think that The For Carnation’s album (Brian McMahan’s post-Slint group) and Papa M’s (David Pajo solo project) ‘Whatever, Mortal’ are just as good as ‘Spiderland’. Or I certainly like them as much as ‘Spiderland’. One of the tragedies of Slint is that they only really made one record. I mean, The For Carnation also had David and Britt Walford in it, so it’s a bit like Slint mark two, but it was very much Brian’s band. But The For Carnation’s ‘Grace Beneath The Pines’ is as good as any Slint song. ‘Beloved Woman’ by David (as Papa M) is amazing, too. They’re just amazing musicians. I really hope that they do make a new record as Slint. That would make me very happy. The new, beautifully expanded edition of ‘Spiderland’ is released on April 14th. Mogwai's latest LP, 'Rave Tapes', is out now and reviewed here.